These are a few of the FAQ that people have asked when enquiring about our parties. If I haven’t answered your question, please call or email me! WHAT AGE RANGE CAN YOU TAKE? The youngest age we will consider is 8. After that – there is no limit! If you want to get together with a group of girls and party -then we want to help. we can tailor the party so that it is as young – or as grown up – as you want. So that we can maximise the best photoshoot experience we keep numbers limited to less than 7 guests. Any more than that and we wouldn’t be able to give each girl the individual attention she deserves. WHAT MAKES YOUR PARTY DIFFERENT? Many places will offer you a portrait shoot – not many throw a full on party with all the trimmings, music, food in its own dedicated room afterwards. Boys are very welcome as a guest they can have great photos too, and enjoy the party experience – although it might all be a bit girly!! CAN WE BRING OUR OWN PARTY SUPPLIES? Of course – it’s your party – no alcohol for under 18’s though! WHAT DOES EACH GUEST GET? Each guest gets the same full on party photoshoot experience as the host – and will also get a mounted print to take home. A great party! Fantastic memories! We will also ensure that she will get a personalised magazine style cover with a photo of her choice from the choice, framed as well as a group photo to take home. There is also a group photo for each guest – so you dont need to worry about party bags! WHAT’S THE QUALITY OF THE PHOTO’S? I am a fully qualified portrait and wedding photographer anyway – I have spent years learning my craft and know how to bring out the best when photographing people. I will ensure anyway you will get lovely photos – this is not a “school photography” type conveyor belt business. WHAT HAPPENS TO ALL THE PHOTOS TAKEN? Once the party is over all the photos will be loaded onto a personal password controlled website (Find your photo) and parents and families will be able to view the photos. There is no obligation to purchase but if you do reprints are available from £10. For the first week after the party there will be a special early bird code giving you an extra 10% off all prices! MY CHILD WANTS TO PLAY PARTY GAMES – CAN SHE? We provide the opportunity to party – if that includes some party games then we are happy for you to organise them but most of our Diva’s just seem to want to dance! I DONT WANT MY CHILD TO LOOK LIKE A PAINTED DOLL WHEN WE OPT FOR THE MAKEOVER! She won’t -I promise. I’m a mum too with a daughter so I understand how you feel (and more importantly about dad will feel!) This is not about making little girls grow up too fast, or look older than their years. It’s a little bit of pampering and fuss and a gentle makeover. We realise “little” is “more” so don’t panic – we know how much to apply! Older girls will have make up applied appropriate to their age. This is about a bit of fun, and hopefully capturing photos of the girls that they – and their families love. 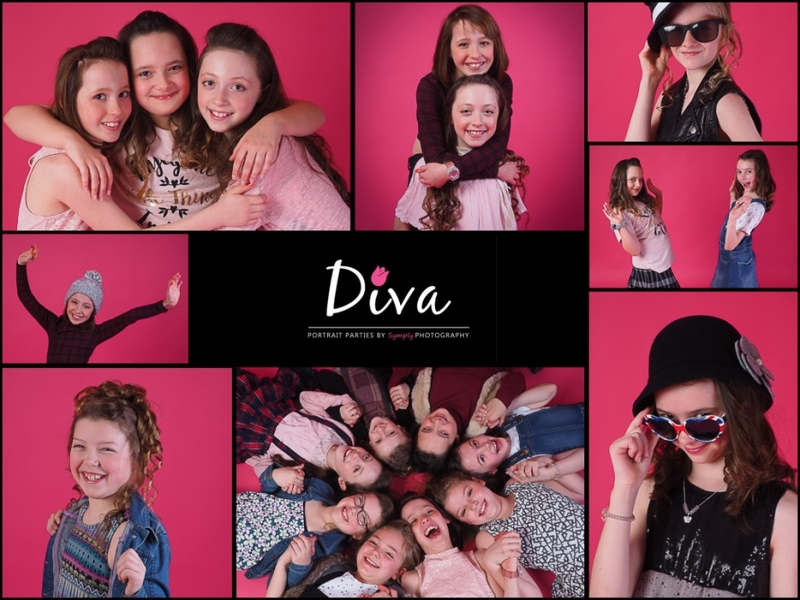 © 2019 Diva Portrait Parties Epinguet De Burton Close Billingborough Lincs NG34 0PY -Tel: 01529 241633 |ProPhoto Photography Template by NetRivet, Inc.